Hilmar Cheese Company Unveils Largest Dairy Mural in the U.S.
Hilmar Helping Hands received thousands of food items on July 13 as part of a “Scoop it Forward” event to celebrate the official unveiling of the largest hand-painted dairy mural in the United States at the Hilmar Cheese Company Visitor Center. Hilmar Cheese Company owners, employees, local officials and the community brought non-perishable food items to donate in exchange for a scoop of delicious ice cream made with Real California Milk as part of the mural celebration, which honors the partnership between the dairy industry and the local community. 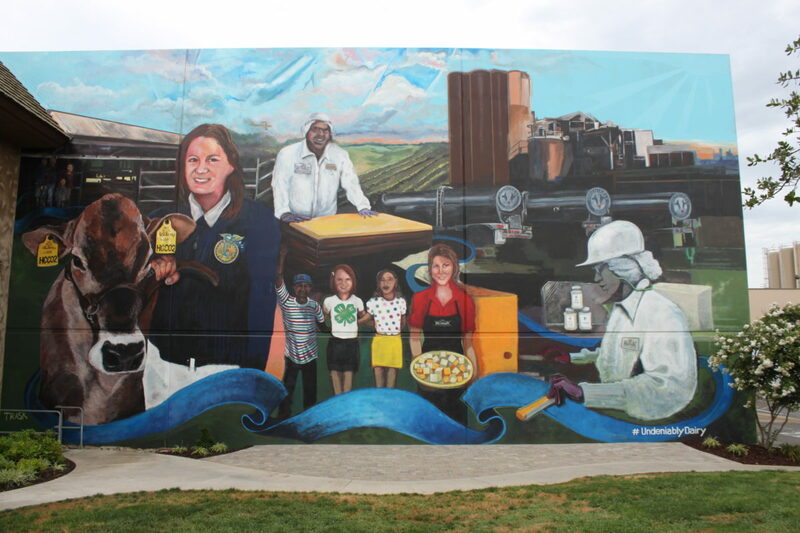 The mural is part of a national effort to celebrate the contribution of dairy farms and farm families to local communities. The Hilmar Cheese Company Visitor Center was selected by the Innovation Center for U.S. Dairy as one of seven locations across the nation to feature a custom mural as part of the Undeniably Dairy campaign. Undeniably Dairy is an industry-wide, national campaign that aims to increase consumer trust in the practices, principles, and people behind the dairy foods people know and love. Standing 32 feet tall by 60 feet wide, the mural is a creation of muralist Ed Trask of Richmond, Va. The mural creation used 22 gallons of paint and 273 different colors. It depicts the Hilmar Cheese Company’s founding principles of farmers, family, community and faith—and its passion for Jersey cows. It also depicts a child's journey from experiencing the visitor center as a youth and showing cows to discovering her devotion to dairy and pursuing a career in dairy innovation and research.